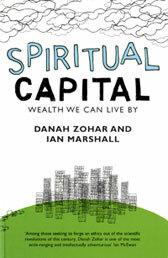 Spiritual Capital presents a new vision of capitalist society that transcends the greed, materialism, and meaninglessness so rampant today. It offers an idea of wealth, profit, and capital that’s about more than simply money. “Profit,” under this system, would be not merely for private gain but would be used in part for public good. “Wealth” would be that which enriches the deeper aspects of our lives, gained by drawing upon our most fundamental purposes and highest motivations and finding a way to embed these in our work. “Capital” is amassed by serving – in corporate philosophy and practice – the pressing concerns of our world. The author’s dream of getting a critical mass of people and organizations to act for what’s right rather than for self-serving reasons. Ideally, spiritual capital would reflect a values-based business culture. Instead of emphasizing shareholder value, it would promote “stakeholder value,” where stakeholders include the whole human race and the planet itself.